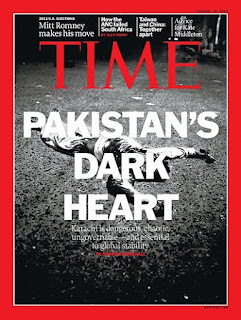 On 16th January 2012, TIME Magazine featured a cover story on Karachi, terming it as 'Pakistan's Dark Heart'. Upon reading it, one is given the impression of a city torn in civil war, instability and on the way to destruction. If I had never been to Karachi, or did not have good friends living there, upon reading this article I would perceive it to be a highly dangerous, volatile place on Earth, where the fashionable thing to own is weapons. Karachi is definitely facing some problems, but the impression portrayed to the world by TIME magazine is highly negative and one-sided. I am a Pakistani, and I will obviously have many reasons and justifications on why Karachi and Pakistan as a whole is not the dangerous state portrayed by the story. However, to make the argument more balanced, I will instead give examples of what Non-Pakistani's have to say about this particular story. The following is a letter written to TIME Magazine by an Australian in rebuttal to the article. I came across it via my brother on Facebook. I recently returned from a charitable trip to Pakistan, whereby I visited both Karachi and Islamabad. I spoke with several universities, key businesses, prominent business leaders and several religious people from all generations…. On the day I returned to the office, someone had placed your magazine (January 16, 2012), on my desk. I read with interest your article on Karachi and the city in doom. For a person to have just returned from the very same place that your magazine described was somewhat bizarre, so I read with great detail your writer (Andrew Marshall’s) account. Let me begin by saying that I often flick through your magazine and find the articles of great interest, but on this particular day and this particular article, I found certain comments to be both one sided and indeed very negative. I say that because I saw a different Pakistan to what was portrayed in your article. I do not and will not comment on the political or religious problems that the country faces, but I will go so far as to say that not everything is as bad as the image that your magazine paints. Sure there are deaths in the cities. Please show me a city in the world that is free from political fighting and unrest. Sure there are differences in the political party opinions. Please show me a country in the world where the political parties agree. Sure the innocent are suffering. Please show me a country in the world where wealth and power is equal and the innocent don’t suffer. Sure corruption is in Pakistan. Please show me a country in the world that is corruption free. My list could go on, but my point is that Pakistan does have problems…but so does every other country in the world in some way or another. However, in the case of ALL other nations, there are often good things to report and the media goes out of its way to promote these good things across the globe, whenever possible. The ridiculous amount of shootings in the USA is balanced off by the success of Google, Microsoft and Apple. The financial dilemmas of Greece are lost in the marketing of the Greek Islands as a holiday destination of choice. The child slave industry of India, is brushed under the carpet in favour of the nation’s growth in the global software boom. What I am trying to say, is that someone needs to look further into Pakistan and see that there are millions of great stories to write about, which would portray the country in a different light, to that what is being portrayed by your article. When I was in Pakistan, I visited a towel manufacturing company (Alkaram Towels). They produced some $60million in export in 2011 and are aiming at $85million in 2012. A substantial increase in sales…in a recession I would remind you. The company was started by the current Chairman, Mr. Mehtab Chawla, at the tender age of nine, after his father passed away. Today the very man employs 3000 staff. Now that’s a story. I visited universities of NED, Hamdard, Karachi, Szabist and NUST. The students are unbelievably intelligent. They spend their spare time developing APPS for android and apple. They are involved in cutting edge technology and no one in the world knows this. Why not send a reporter to Pakistan to look into this. Why not research good things in this nation, rather than just the bad things. At NUST (National Institution for Science and Technology – Islamabad)) there were 38,000 applications for medicine. There are only 83 seats for the medicine course on offer. The competition is unbelievable. In short it pushes the best to be even better. But the world doesn’t know this. Why? Because no one wants to report on it, or no one knows about it…or both!! Please do not get me wrong. I understand that news is news, but it is high time that the western world stopped promoting these terrorists and political wars in Pakistan and started to write something that would help the nation. Something positive. If we really care about global partnerships and economic growth, then I suggest we try and give Pakistan a helping hand. There are 180 million people in Pakistan, 65% are under the age of 25. The youth of Pakistan is its strength.. it is like a sleeping giant. If you think that India is a booming nation. I suggest you stop a second and look at Pakistan. Given a little help from the western world, Pakistan can become a dominant economy. She doesn’t want aid and she doesn’t need money… she just wants the chance to be seen in a different light. I believe we have a fundamental obligation to assist. The only question is, who will reach out first. I did double check before posting and yes there is a Tony Lazaro of Rising Stars Management Group who wrote this letter. 'The trip, which started on a positive note, was however dampened when I stopped to pick up a copy of Time magazine at the airport with the lead story about Pakistan titled: “Pakistan’s Dark Heart.” It is these perspectives that I wanted to escape after being so bombarded with negative sensational stories about Pakistan in the West and India. Also, the constant warnings here in British Columbia that Sikhs are not safe in Pakistan, that I should not travel with a Sikh and that I am crazy to travel there added to my panic. But once in Pakistan, I found the opposite to be true. This piece illuminates, not the dark heart of Pakistan, but the kind, generous and sincere hearts of the Pakistani people in general and the respectful treatment of Muslims towards Sikhs and Sikh shrines in particular. Videos on youtube have also sprung up by foreigners who have actually seen Karachi and Pakistan against the one sided article by TIME Magazine such as the one found here. If you want to read a copy of the article published in TIME Magazine, a copy was also published on this site since I do not subscribe to TIME Magazine. 'Indeed, the Pakistan that is barely documented in the West – and that I have come to know and love – is a wonderful, warm and fabulously hospitable country. And every writer who (unlike Hitchens), has ventured out of the prism of received opinion and the suffocating five-star hotels, has ended up celebrating rather than denigrating Pakistan. A profile of Karachi – Pakistan’s largest city and commercial capital – in Time magazine earlier this year revealed that more than 1,000 people died in 2011 in street battles fought between heavily armed supporters of the city’s main political parties. Many write of how dangerous Pakistan has become. More remarkable, by far, is how safe it remains, thanks to the strength and good humour of its people. ...the Daily Mirror had the inspired idea of sending Botham’s mother-in-law Jan Waller to Pakistan – all expenses paid – to see what she made of the country. Honestly, no, I was not, and I did not. Even before coming to Pakistan, I found the notion that all 180 million people residing in Pakistan, the sixth most populous nation in the world, were terrorists or had extremist tendencies completely ridiculous. I figured that, as in every country, Pakistan had people from all walks of life with different creeds, hopes and dreams, opinions, and lifestyles. A great piece..Nice article. TIME has an agenda ..Even the LIFE magazine from 1948 you posted called Quaid e Azam a dictator(Although I fail to understand whats wrong with being a dictator unless you go the dark side). These magazine are no better then Pravda! Appreciate your feedback Early Riser. Interesting link you have posted. I have updated this blog post to include the Telegraph UK article that I came across today. Excellent work! I always hated Time Magazine, now I want to burn them all!